Interested in learning how to maintain and repair your historic building? Attend the Midwest Preservation Trades Expo, May 10 and 11 in Louisville. The event will feature hands-on demonstrations and informative exhibits on a wide array of preservation-related topics. The 13th annual New Albany Historic Homes Tour will be held on Saturday, September 8 and will feature nine noteworthy historic properties across the city, including the Charles Moser House pictured below. 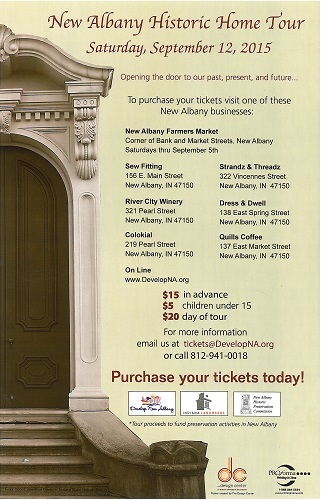 Tickets are on sale now for $15 per adult ($20 day of tour), and all proceeds benefit preservation activities in New Albany. The New Albany Historic Preservation Commission - with support from Develop New Albany - presented its annual Facelift Awards on May 16, 2018. The ceremony was held at the Culbertson Mansion State Historic Site and honored seven outstanding projects from across the city. Pictured below from left to right are Jacob Resch, who with his father Steve and mother Donna received a pair of awards; Third District City Councilman Greg Phipps; and At-Large City Councilman and Facelift Awards committee member Dave Barksdale. The c.1860 Smith-Franck House, located on 9th Street in the East Spring Street Historic District, is available for a limited time. The duplex, with about 1545 total square feet of space, is free but would need to be relocated, with the new owner responsible for all moving costs. It will be open for inspection on Friday, 20 April from noon-1 PM. The New Albany Historic Preservation Commission, Develop New Albany and Indiana Landmarks invite you to join us for the 12th Annual New Albany Historic Home Tour. This year's event will be Saturday, September 9, from 10 AM to 5 PM, and all proceeds from the tour benefit preservation activities in New Albany. City leaders announced three major historic preservation projects yesterday - the rehabilitation of the Knights of Columbus hall on East Main Street, the rehabilitation of the fire-damaged Louis Hartman House in partnership with Indiana Landmarks, and the adaptive reuse of the former Reisz Furniture Warehouse as City Hall. Read more about the projects here - http://newalbanycityhall.com/home/2017/8/8/city-moves-to-protect-our-history - or watch a video here - https://cityofnewalbany.com/new-albany-historic-preservation-projects/. Congratulations to 2017 Facelift Award winners! 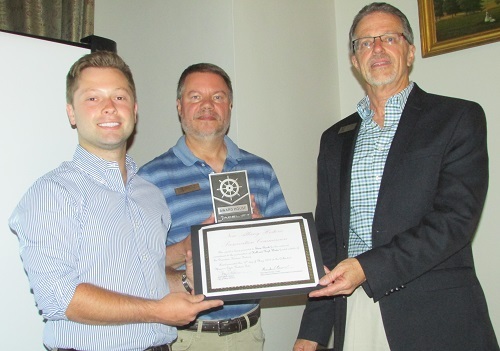 On May 17, the New Albany Historic Preservation Commission presented its annual 'Facelift Awards,' in cooperation with Develop New Albany and the City of New Albany. Five projects from across the city were recognized for their excellence in preservation or rehabilitation. May is National Historic Preservation Month, and we'll be celebrating the occasion with tours, awards and a workshop. To complement its ongoing grant program for commercial and industrial buildings, the New Albany Urban Enterprise Zone Association is now also offering facade grants for residential properties within the UEZ. The regular October meeting of the Historic Preservation Commission has been moved back one week, to Wednesday, October 26. The meeting will be held at 7 PM, in the regular meeting location in the third floor Assembly Room of the City-County Building. 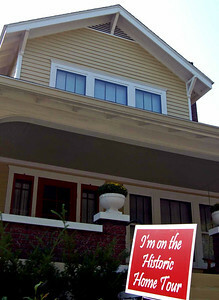 The 11th annual New Albany Historic Home Tour will be held on Saturday, September 10 from 10 AM - 5 PM. Twelve properties will be featured, including homes in Silver Hills and the East End, and two shotgun homes. 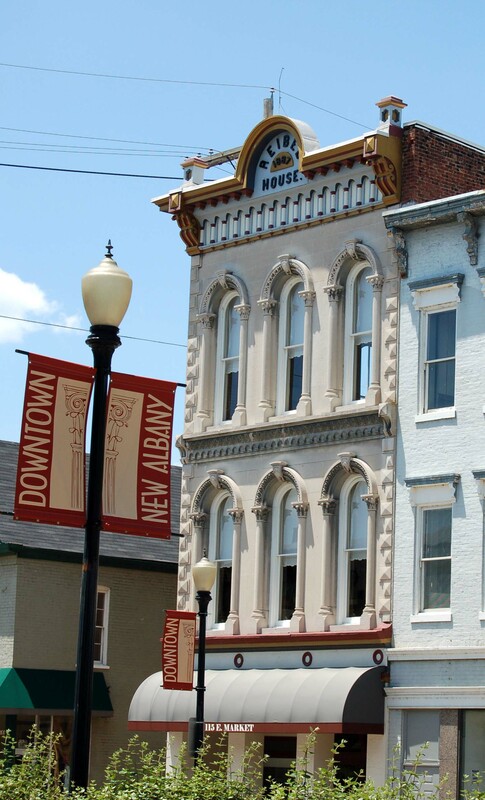 The New Albany Historic Preservation Commission, in partnership with the City of New Albany, was recently awarded grant funding through the Indiana Office of Tourism Development. The grant will be used to create and install custom street sign toppers to identify the city’s historic districts. The New Albany Historic Preservation Commission and Develop New Albany were pleased to honor five outstanding rehabilitation projects with 'Facelift Awards' at a May 18 ceremony. Mayor Jeff Gahan was on hand to help recognize the winners. Below, Rev. 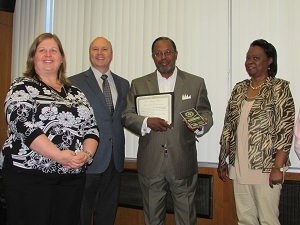 LeRoy Marshall and his wife Joyce (right), receive the award for the Second Baptist Church, from the Mayor and Facelift Award committee member Vicky Nugent. Join us in May 2016 for a variety of tours, workshops and other events celebrating National Historic Preservation Month. The NAHPC will hold a public hearing at 7 PM on Wednesday, April 20 on the proposed listing of the M. Fine & Sons shirt factory building (1420 East Main Street) in the National Register of Historic Places. 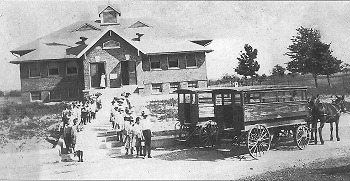 RE/MAX Results will be hosting a centennial celebration for Jacobs Chapel School and its Fall Festival for Kosairs on Thursday, October 29. Preservation Louisville has announced its 2015-2016 'Hands-On History' preservation maintenance workshop series, covering topics ranging from plaster repair to how to 'green' your building. 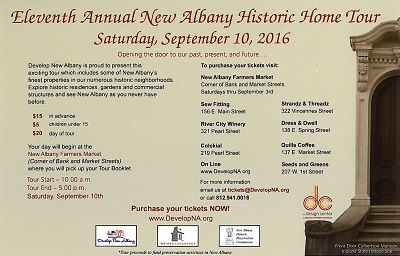 The Tenth Annual New Albany Historic Home Tour will take place on Saturday, September 12. The tour runs from 10 AM - 5 PM and will include eleven historic properties, ranging from homes to a church to a firehouse. The 2015 Facelift Awards were presented in a ceremony on May 20. Mayor Jeff Gahan joined the Historic Preservation Commission and Develop New Albany in presenting the awards to eight outstanding preservation projects. Below, "The Scribner Ladies," along with project architect Ron Stiller, receive their award for restoration of the 1814 Scribner House. May is National Historic Preservation Month, and there will be plenty going on in New Albany all month long! Like to learn how to repair your wooden windows and make them more energy efficiency, and get the hands-on skills to feel comfortable tackling the job? Then attend River City Window Works' Window Restoration Boot Camp on Saturday, April 25. NEW DATE - As part of its regular 'Hands on History' program, Preservation Louisville Inc. will be offering a workshop on Saturday, March 28, 2015 on Historic Paints: Colors and Techniques. The nomination process for the proposed expansion of the East Spring Street National Register Historic District continues. The nomination form has been completed, and a public hearing on the expanded district is planned for Wednesday, December 17 at 7 PM, in conjunction with the regular meeting of the Historic Preservation Commission. The meeting will be held in the Assembly Room on the third floor of the City-County Building, 311 Hauss Square in downtown New Albany. The proposed expansion is of the National Register-listed district, not the locally-regulated historic district, and the listing would not place any additional restrictions on property owners within the district. 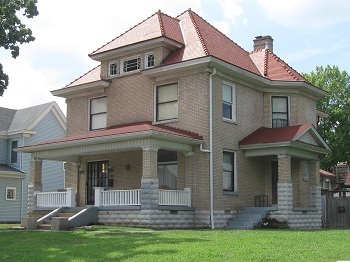 Preservation Louisville will host a workshop on Saturday, October 11, 2014 from 1-4 PM, covering what to do - and not to do - as part of a successful preservation project. The regular October meeting of the Historic Preservation Commission has been moved forward one day, to Tuesday, October 14. The meeting will be held at 7 PM, in the regular meeting location in the third floor Assembly Room of the City-County Building. The Historic Preservation Commission and Develop New Albany were pleased to present the seventh annual Facelift Awards at a reception prior to the May 21 Commission meeting. Four outstanding preservation projects were recognized at the ceremony. Third District Councilman Greg Phipps - whose district includes three of the winning projects - helped to present the Bruce Fox-designed plaques to the winners. The staff of the Indiana Room of the New Albany-Floyd County Public Library will be leading two tours highlighting Floyd County's historic cemeteries, on Saturday 31 May and Saturday, 14 June. Spring is finally here, and that means National Preservation Month is almost upon us. During the month of May, the Historic Preservation Commission and its preservation partners will be offering a wide array of tours, presentations and activities - please plan to join us! The New Albany Historic Preservation Commission will host a meeting on Thursday, September 26, 2013 to discuss the possible expansion of the East Spring Street National Register district. The meeting will be held at 7 PM in the gym at St. John Presbyterian Church, 1307 East Elm Street. The New Albany Historic Preservation Commission was pleased to present its 2013 Facelift Awards to five very worthy projects across the city. The honored projects - which included two commercial buildings, a church, and two homes - were recognized at a ceremony prior to the Preservation Commission's regular meeting on May 15. 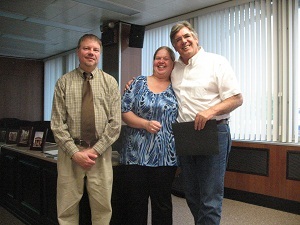 The photo below shows Ian Hall of The Exchange Pub and Kitchen receiving his award, from Facelift Award Committee members Vicky Nugent and Dave Barksdale, and (far right) New Albany's Director of Planning, Scott Wood. 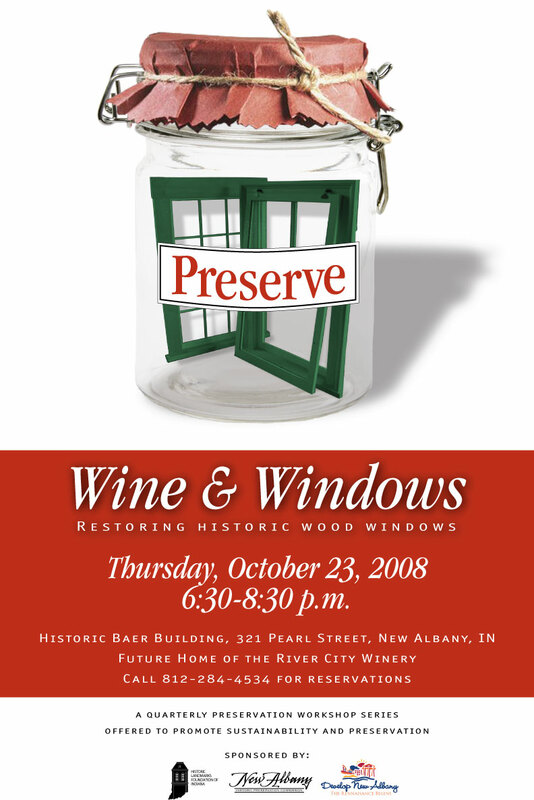 New Albany will mark National Preservation Month with a full schedule of activities, including workshops, tours, and the Preservation Commission's annual Facelift Award presentation. Please plan to join us for some or all of these great events! Considering replacing your windows as a way to improve your home's energy efficiency? A new study conducted by the Preservation Green Lab of the National Trust for Historic Preservation has examined a number of window improvement options, comparing the relative energy, carbon and cost savings, in different climate zones across the country. The results show that a number of the existing retrofit options come very close to the energy performance of high-performance replacement windows, at a fraction of the cost. St. Elizabeth's Catholic Charities has recently acquired the former Rectory at the corner of East 7th and Market streets, and plans to rehabilitate the 1870 building as office space. All are invited to come see the building at a public open house on Thursday, 11 October 2012, from 5-7 PM. Preservation Louisville, Inc. has announced the 2012-13 schedule for its popular "Hands-On History" workshop series, designed to give participants an in-depth look at various preservation issues and methods of maintaining and preserving older buildings. Participants will learn practical, hands-on techniques for working with original materials and finishes to maintain, restore and preserve historic elements such as plaster, windows and stained glass. A free seminar on fire safety in historic buildings will be offered on Saturday, August 25 in Madison, Indiana. 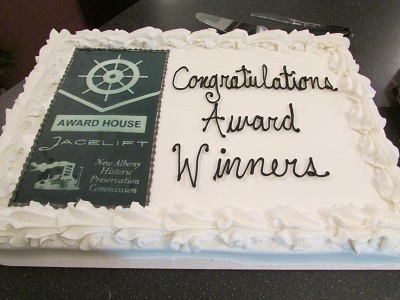 At a ceremony prior to its May 16 meeting, the NAHPC recognized the winners of the fifth annual "Facelift Awards." Five property owners were recognized for their outstanding restoration or rehabilitation projects, both residential and commercial. 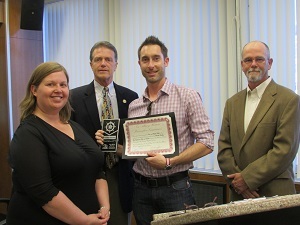 Third District City Councilman Greg Phipps (left in the photo above), whose district includes much of New Albany's designated historic districts, helped to present the awards. Also pictured is happy winner Paul Collings, along with Facelift Award committee member Vicky Nugent. May 2012 will busy, as the Historic Preservation Commission and its partners will again offer a full slate of Preservation Month activities. Join us for a range of tours and workshops, as well as the annual presentation of our Facelift Awards. Interested in having an expert walk you through how to repair your historic wooden windows? Visit our 'Resources' page for a link to a YouTube video series from the Michigan State Historic Preservation Office. Resources on how to research the history of your home, and the top 10 restoration mistakes have also been added. NAHPC presents 4th Annual "Facelift Awards"
Prior to its regular May 18 meeting, the New Albany Historic Preservation Commission presented its annual "Facelift Awards," to honor outstanding restoration, rehabilitation and preservation projects in the city. This year, seven projects were recognized. Deputy Mayor Carl Malysz was in attendance to help with the presentation of a Bruce Fox-designed plaque, a certificate, and a framed photo to each of the winners. Hedden's Grove Historic District and the William Young House were added to the National Register of Historic Places in December, thanks to a grant received by the Historic Preservation Commission. May is National Historic Preservation Month, and the NAHPC and its partners have a full slate of workshops, tours and other activities planned! In December 2009, the New Albany Historic Preservation Commission adopted a new set of guidelines for signs in the historic districts. Historic Baer Building – New Home to the River City Winery! Develop New Albany is proud to present this exciting tour which includes some of New Albany’s finest properties in our four local historic districts. Explore nine historic residences and commercial structures and see New Albany as you never have before. Click here to view the homes on tour. Your day will begin at the New Albany Farmers Market (Corner of Bank and Market Streets) where you will pick up your Tour Booklet and Driving Map and begin your self-guided tour of New Albany treasures. The New Albany Historic Preservation Commission expresses support for Historic Landmarks Foundation of Indiana and the effort to save two homes from demolition. Walking Tours, Workshops and More. Visit the EVENTS Tab for all the details. May is full of events celebrating Preservation in New Albany! Planning Exterior Work in a local historic district? Is your home located within a New Albany Historic District? Don’t forget that you’ll need approval from the New Albany Historic Preservation Commission before beginning any exterior work. Review the Design Guidelines by clicking the Resources tab above. For more information contact NAHPC Administrator Laura Renwick at 812/284-4534. 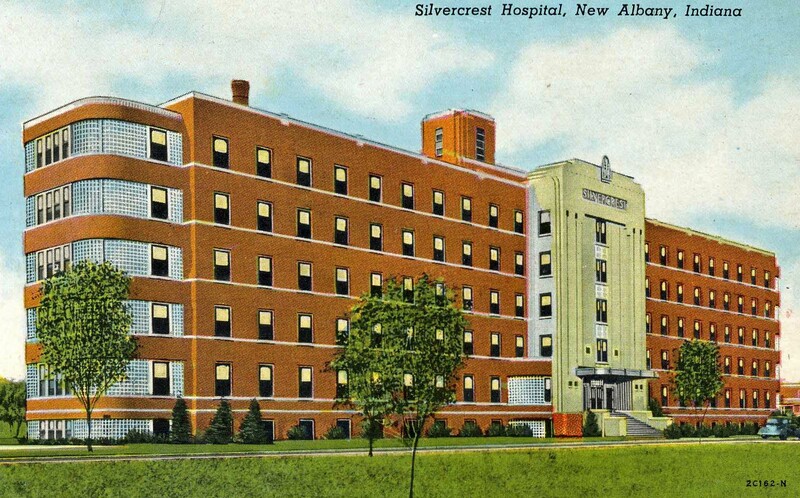 The New Albany Historic Preservation Commission has been monitoring the discussions of the Silvercrest Hospital Historic Site during the last few months. Recent articles mentioned the possible razing of structures on the site. The New Albany Historic Preservation Commission has recently become a member of the National Alliance of Preservation Commissions (NAPC). A benefit of membership is access to a wealth of information and educational materials. The article below on painting and replacing windows, by Bob Yapp of Preservation Resources Inc., is a perfect example. Future articles will be available on the "Resources" tab on this website. 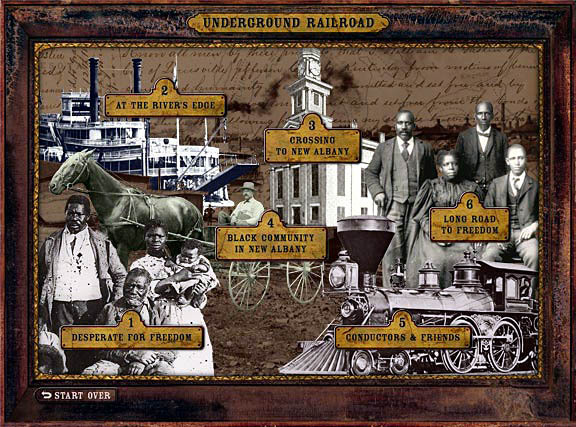 Carnegie Center for Art and History, New Albany: The Indiana Historic Preservation Award for Outstanding Interpretation of the Underground Railroad in Floyd County has been presented to New Albany's Carnegie Center for Art and History. Visit http://www.carnegiecenter.org/ for more information. The Indiana Historic Preservation Awards are presented to recognize and congratulate the efforts of individuals, organizations and agencies that educate, preserve and advocate on behalf of cultural resources throughout Indiana. 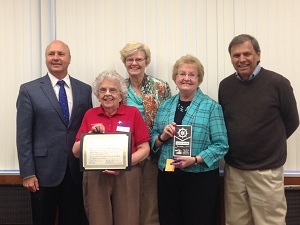 New Albany is this year’s recipient of Historic Southern Indiana’s Community Legacy Award. The annual award recognizes a southern Indiana community for outstanding achievements in preservation, enhancement, and promotion of its distinctive heritage.